This post originally appeared on the From Poverty to Power blog on 1 August, 2018. Among development’s chattering classes, scale is a hot topic – what’s the point of supporting small pockets of progress, unless we can scale them up to the country/population at large? In the shanty towns of South Africa, we’ve seen our work go to scale, sometimes by intent, but often by accident. Both channels matter. Last year IBP South Africa’s Jessica Taylor collaborated with Shumani Luruli and Mike Makwela of local organisation Planact and the Social Audit Network’s Thando Mhlanga on a sanitation social audit in the Wattville township east of Johannesburg in Ekurhuleni Metropolitan Municipality. The project achieved significant results almost immediately when faulty portable toilets were improved and additional toilets delivered. You can view a short film about the audit here. While many of our stakeholders were excited about the project for a short time, we almost immediately started getting questions about scale. 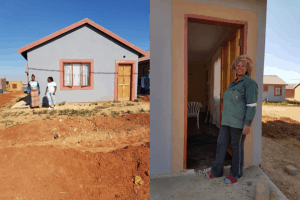 After all a few extra toilets do not make a significant contribution to the massive challenge of ‘opening budgets to transform lives’ (IBP’s tag line) in South Africa. In response to this (hopefully?) friendly criticism Jessica, Shumani, Mike, Thando and new IBP South Africa recruit Sfiso Mollo, scaled up our work in Ekurhuleni Metro significantly this year. The scaled up social audit covered the same service and the same sanitation contract; but this time involved 10 additional informal settlements across all five of the poorest parts of Ekurhuleni. This scaled-up approach immediately bore fruit, with the Ekurhuleni supply chain management and water and sanitation departments now using the audit findings when they draft new sanitation contracts. Our social audit findings are now having an impact way beyond the sites that we actually audited. The scale of the audit was also rewarded by the interest of the Auditor-General, who observed this scaled up social audit to see whether such information could inform risk assessments and assist in sampling processes in future across the whole of South Africa. We haven’t yet heard the result, but the impact could be huge. To date, however, the biggest shift to scale has arguably not been what we included in the project plan, but what happened outside it. Informal settlements residents in Wattville (the site of the original audit last year) gained such confidence from the social audit that they continued to engage with government on their own account, using their new skills to access and engage with the necessary information from the municipal department of Human Settlements. They regularly visited the department for updates about plans, budgets and the development of a list of housing beneficiaries. This ultimately ensured that 148 families moved from their shacks into brick and mortar new homes just a year after the social audit took place. It is important to note that these houses were delivered by a different department to the one engaged in the original social audit. This community therefore took the sense of empowerment that they developed around the sanitation social audit and engaged with the Department of Human Settlements. This is but one of many stories that we are hearing about how disempowered communities use the skills and the confidence that they gain during a social audit process to engage other parts of government. The Wattville community have also successfully engaged the national department of home affairs to register local residents for identity documents. Amartya Sen beautifully captured the essence of development as the progressive expansion of the freedoms to be and to do. What we have seen in some of the most deprived places in South Africa, is that development at scale can be achieved deliberately, but can also come in unintended ways when a spark lights empowerment’s fire in the hearts of excluded communities and they take it from there.